The new Xeon 45nm (or Xeon 54xx series) arrived in the lab weeks ago, so a server CPU benchmark update is overdue. However, there is another reason we decided to write this article. When AMD launched their newest quad-core chips, we could only give you a preview of its performance - not a full review. We did not fully understand many of the performance aspects of the new AMD architecture, so we decided to delve a little deeper. We will only focus on performance in this article, as our primary goal is to get an idea where Barcelona (AMD's quad-core), Harpertown (Intel 45nm quad-core Xeon), and Clovertown (Intel quad-core 65nm Xeon) stand. To do so, we performed a minimal profiling of each of our benchmarks and we used several new micro benchmarks that will tell you a lot more than some real world benchmarks can. If you like understanding the benchmarks out there a bit better, dig in. The Radix 16 divider is the most interesting of these improvements. Dividing involves a repetition of subtractions, tests "if-it-fits" and shifts. If you can do this with four bits at a time instead of two, this means that you can cut the number of these iterations required to get your result in half. The square root calculation is similar and also benefits from these improvements. While divisions and square roots are rather rare in common software, they have a very significant performance impact. Contrary to the more "popular" instructions, they are not pipelined and the latency of these instructions is high. For example, a floating-point multiply takes five cycles and the "Clovertown Core" architecture can finish one every two cycles thanks to pipelining. However, a floating-point division takes no less than 32 cycles and cannot be pipelined at all. 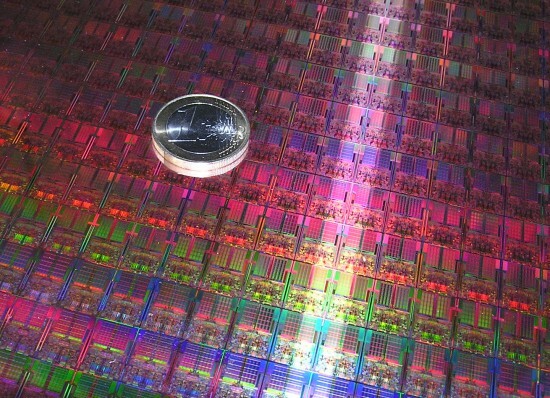 Besides being an improved "Clovertown", the new Xeon is also a marvel of nanotechnology with no less than 410 million transistors on a die of only 107 mm². Two die make one quad-core Xeon 54xx. Considering that this CPU is close to behemoth CPUs like Itanium and Power 6 in SPECint performance, the new Intel is a formidable adversary for AMD's newest quad-core. There is more than the CPU of course. The new CPU works on the old "Bensley/5000P chipset" platform, though we were not able to get it running on our P5000PSL Intel motherboard despite the fact that we applied the BIOS update that came out early this month. There is also a new HPC/workstation platform for the Intel Xeon thanks to the Seaburg chipset, which features an improved snoop filter. Besides reducing the snoop traffic, the new chipset should also be able to extract more bandwidth out of the same FBDIMMs. The support for DDR2-800 FBDIMMs should bring another performance boost but our current test platform is only stable with DDR2-667 FBDIMMs. ok .. getting tired of this! Intel loving Anandtech employs very unfair & unreasonable tactics to show AMD processors in bad light every single time. And most readers have no clue about the jargon Anandtech uses every time. I think a lot of us are intrigued by AMD's memory architecture, its ability to support NUMA, etc. A lot of benchmarch test how fast a small application runs with a high cash-hit rate, and that's not necessarily interesting to everyone. The MySQL test is the right direction, but I'd rather see numbers for a more sophisticated application that utilizes multiple cores -- Oracle or MS SQL Server, for example. These are products designed to run on big iron like Unisys multi-proc servers, so what happens when they are running on these more economical Harpertown or Barcelona. The BA stepping was the improved form for B1s, and the B3 stepping is the improved form of the B2. BA and B2 came out at the same time in Sept (though BA was the one launched, B1 was what was reviewed), B2 for Phenom and performance clockspeeds, BA for standard and low power chips. Well, we are still seeing 5-10% better integer performance on applications that are runing in the L2, so it is more than just a K8 with a better IMC. But you are right, I expected more too. At any rate, it was the most in-depth review I've seen, especially with the code analysis. I too, thought it would be higher, but remember that Barcelona is NOT HT3 and doesn't have the advantage of "gangning\unganging." There was an interesting article recently that showed perf CAN be improved by unganging (maybe it was ganging, can't find it) the HT3 links. I really hate that OEMs decided to stand up to the big, bad AMD and DEMAND that Barcelona NOT have HT3 with ALL OF ITS BENEFITS. I mean people complain that Barcelona uses more power, but HT3 would cut that somewhat. At least in idle mode, and even in cases where IMC is used more than the CPU or vice versa. I also may as well use this to CONDEMN all of these "analysts" who insist on crapping on the underdog that keeps prices reasonable and technology advancing. INSERT SEVERAL EXPLETIVES. REPEATEDLY. FOR A FEW DAYS. A WEEK. FOR A YEAR. Conjecture regarding why AMD went quad core on the same die... and this has nothing to do with performance. I think one place where Intel is way ahead of AMD is package technology. Remember they were doing a type of Multichip module with the P6. Having 2 dice instead of a single die allows them to have an overall lower defect rate, higher yield, and higher GHz. This is vs. AMD's lower GHz but (it was hoped) greater data efficiency using an L3 die and lower latency of on-die communications amongst cores vs. Intel's solution of die to die communication. Seriously, can you buy the 2360SE? Newegg doesn't even stock the 1.7Ghz 2344HEs.